In recent weeks, I, like many other people around Vancouver, find myself in a painfully consistent routine each morning. It begins by hitting the snooze button on my alarm clock more than a handful of times – at minimum. Failing that, I spend my first waking moments considering any plausible excuse to stay in bed that particular morning. Once reality kicks in, I know that the sensation of being rain-slicked while my boots become a decoupage of wet leaves is a looming inevitability. This is made even worse being that I have a dog who is desperate to pee the moment he bounds out of bed and before I leave for the office. Despite umbrellas and hoods, my hair also falls victim to the season. I ask myself each day why I bother blow-drying, but it’s something I always do anyways. It’s the routine. After the eating of breakfast and the shower and the make-up and the blow-drying and the careful choosing of matching unmentionables comes the dreaded wardrobe selection. I must attire myself appropriately for the office but what I wear must also be functional enough to be tucked into galoshes and under a raincoat. Almost none of my office apparel fits the bill in this (or any) regard, so I normally leave my apartment a complete disarray of sunshine. The only decision that then needs to be made is red bikini, blue bikini or new bikini? You decide. As an aside, I apologize for the lack of blog posts. I really have no valid excuse that would appease you. Feel free to stalk me on Twitter in the meantime. Can I vote for new? treat yourself to a new one! Wow looks like a beautiful place. Is that Miami or Hawaii? 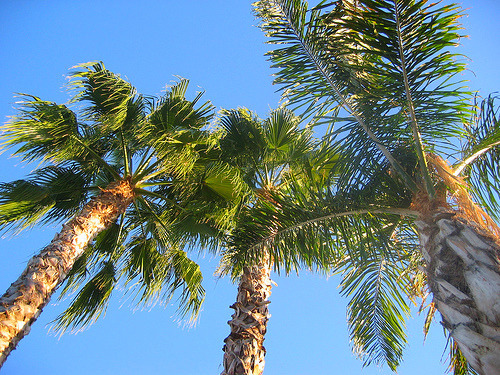 Just my guess palm trees beautiful sky I would love to go too but fiance is taking me to Peurto Rico soon. Blue…and treat yourself to a gorgeous new top! @Megyn – Neither. It’s Phoenix. SO lucky.. Bring them all. put up some pics of you in each so we can see what we’re betting on? Looks like your readers would like to see a certain blonde sporting a bikini! I’m excited to hear about your Phoenix trip! I was in Phoenix a couple weeks ago and just booked another flight back for February. I can’t get enough of Arizona.